A fast-paced narrative filled with suspense, Generation Chef is a fascinating behind-the-scenes look at drive and passion in one of today’s hottest professions. Karen Stabiner is a journalist and author of narrative non-fiction. She has co-authored the cookbooks Family Table, a collection of staff meal recipes and backstage stories from Danny Meyer’s Union Square Hospitality Group restaurants, and The Valentino Cookbook with Piero Selvaggio. Her feature articles and essays have appeared in The Wall Street Journal and The New York Times, as well as in the Los Angeles Times, Saveur, Travel & Leisure and Gourmet. Her work has appeared in Best Food Writing anthologies. Stabiner teaches at the Columbia University Graduate School of Journalism. "Generation Chef is as appetising a start-up tale as a plate of bite-sized Basque pintxos served up by protagonist chef Jonah Miller." "You'll gobble up this delicious behind-the-scenes account of a start-up restaurant in New York City...This book is as much about dreams and passion as it is about food." 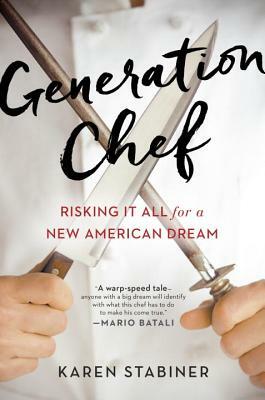 "Generation Chef is the warp-speed tale of passion on a plate, a frank inside look at a twenty-six year old chef who opens his first restaurant. Karen Stabiner has a sharp eye for the story inside the story – anyone with a big dream, whether it’s food or something else, will identify with what this chef has to do to make his come true." "A deftly written look at the high stakes, low glamour back story of launching a restaurant. Deeply insightful, this is a must-read for culinary school grads or anyone getting into the industry."